Much like its name implies, the Node Popularity Report shows you the overall popularity of every one of the nodes in your decision tree, ultimately letting you see how often each one is visited. More than just seeing which nodes are getting the most love, this report also allows you to find out where users are getting stuck as well, as you can take note of trends in node drop-off. 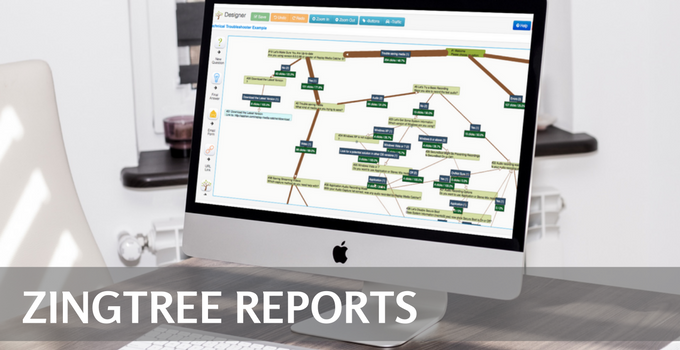 Once the report is built, you can quickly scroll through a break down of each decision tree node, the node’s name, and the number of visits to each one. Keep your node View as Page Titles, or choose to show the questions and answers. Plus, click into each node detail for additional information on the time a node was selected, duration of time spent on a node, and even the source.